Queuing | Run Thomas! Run! Someone pointed out to me yesterday that there has been a certain element of negativity towards the French in my recent blog posts. I was aiming to rectify this today by writing a long list of things I love about France and the French. I sort of got stuck after 4 items, so we’ll save that for tomorrow. So, a bit like making sure you finish your starter before the main course arrives, I thought we’d gouge out the last bit of anti-French melon and pop it in our mouths before the plate gets taken away. Queueing. How hard can it be? I think it’s a measure of a society as to how well it’s citizens can queue. I have a special relationship with the French approach to queuing as during a scramble for water at 30km into my first marathon a French guy managed to push me off the track and into a race marshall. At first I blamed him, but then I realised I hadn’t understood fully the process of standing in line for goods and services in the land of garlic and baguettes. Queueing in France is a two stage process. Stage 1 I term “UN Food Truck Arriving In War Torn Village“. Lets imagine we’re waiting to go on a ride at a French fair. The ride has not arrived yet, so there is an element of confusion. Pre-stage 1 the French will begin to hover around the entrance to the ride like wasps around a jam sandwich. There will be chaos, but it will be organised chaos, like a flock of birds which wheels and turns as a single organism. As an outsider you need to be careful not to be drawn into thinking you can join in this phase. The British do not have the genetic conditioning for it. As a Brit your instinct is to assume that a queue will organise in an orderly fashion at some point, roughly working on the first-come, first-served basis. As a Brit you must remain stock still near the ride entrance as the French wheel and turn around you. The queue must coalesce soon, and you must wait for the moment. Poised. Like a panther, ready to strike. At this point the French will surge. Children, animals and defenceless old grannies will be trampled, crushed or pushed aside as the flock moves as one to try to establish queue superiority. If you’re not prepared for this, you can quite find yourself not only pushed behind the pouncing flock but also random French people that have run from hundreds of metres away, drawn inexorably towards to the carnage. The French love this bit. You can see the joy in their eyes as six year olds are flung to the floor and walking sticks are kicked out from OAPs. This isn’t just survival of the fittest. This is survival of the Frenchest. I get the feeling if Darwin had just popped over the Channel in the Beagle and watched the French queueing we’d have had the Origin of Species about a decade earlier. If you’ve ever been to one of those live action re-enactments where 40-something men poke one another with rubber swords all day then that’s what it’s like. So Stage 1 ends. The dust clouds settle. 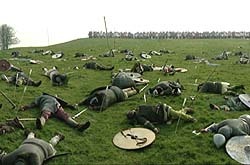 The injured crawl from the battlefield. The walking wounded apply tourniquets and push dislocated joints back into place. As a Brit you’ll inevitably be at the back of the queue by now. Probably hundreds of people back, with a black eye, bleeding shins and an unconscious child at your side. You have to accept this. No non-French person can win Stage 1. What you need to do now is steel yourself for Stage 2 which I term “Feeling Your Life Drain Away Like Sand Through The Fingers Of Death Himself“. Here the flock undergoes a strange transformation. Once a French person is in a queue, he or she will stay there quite happily for days. French society is based on extreme levels of bureaucracy. Most French people will spend a sizable chunk of their lives standing in a queue waiting for a bit of paper which enables them to go and stand in another queue to get another bit of paper. This makes them happy. Once they’ve fought for superiority the French will contentedly stay in a queue all day. They won’t get frustrated if it doesn’t move. Indeed, they’re happiest if it moves along at the speed of an arthritic tortoise. The French take great pleasure at conducting business as slowly as possible once a queue is formed. Payment by cheque is practically encouraged as it takes ten times longer than playing by bank card or cash. Cheque books are also normally kept at the bottom of large handbags which take upwards of 10 minutes to search. Behaviour that would elicit tutting and sighing (and probably a fist fight) in a ASDA queue just causes French people to serenely smile and sigh in happiness. Nothing makes a French person happier than standing in a queue all day, especially if they’ve had a good fight to assemble that queue in the first place. What this means in a practical sense is by the time you, as a foreigner (stuck at the back of the line) reach what you’re queueing for, it will be shut. It always is. The thing you want to do will always be shut or closed by the time you finally get to the front of the queue. Every. Single. Time. So, what tactics can we use to beat the French queuing system? There are no tactics. As with many of my important facts about the French they are absolutely useless other than allowing you to mentally prepare should you ever find yourself in the situation I’ve outlined. Oh 11.5km ran today. Forgot to mention that.